After our well attended jumpstart sessions yesterday, we officially kicked off the inaugural pan-European edition of the Winshuttle User Group Conference with a keynote presentation by featured guest speaker, Nigel Barlow. 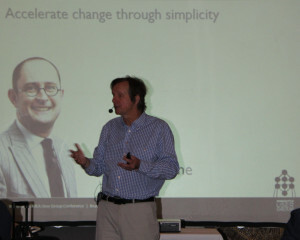 For more than forty-five minutes, Nigel engaged our attendees on how to think differently and challenge the status quo. His ideas on creativity and innovation resonated with our customers and the Winshuttle culture as a whole. A lighting manufacturer spoke about how Winshuttle has become indispensable because of a dynamic market that sees new types of lighting introduced every month. 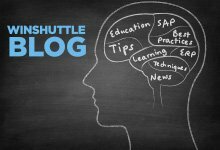 They have to nimble enough to respond, and Winshuttle allows them to be much more responsive and flexible in the way they manage their 730,000 materials in SAP. Next, a producer of specialty chemical materials summarized their lessons learnt from a global rollout of Winshuttle forms and workflow for a variety of internal processes. By standardizing their global processes, they are now reaping the benefits of improved data quality and optimized processes. An impressive 30% of all of their employees are using Winshuttle in their jobs and are continually scoping out new processes to automate. Finally, we had a large company from Saudi Arabia demonstrate how Winshuttle forms and workflow solutions can handle advanced scenarios. 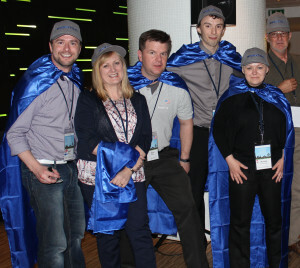 In this case, they had a very complex business process for setting up a new customer in SAP. In Saudi Arabia, there is no public credit agency and credit terms are effectively decided by eight different committees. They built a workflow to facilitate eight parallel approval streams, with five approvers each.